This is an extra-curricular English class. This class is intended for children from 4 years old (kindergarten second year) to elementary school age. "Immersion" means absorption through constant contact. We use American textbooks and Grape SEED materials for our lessons and teach our students important language basics in an English-only environment. We primarily use Grape SEED materials throughout our lessons. Grape SEED materials are divided into units, and all relevant teaching materials are included in each unit. For example, words that appear in flash cards will also appear in a poem or story. In addition, we will teach math and science using textbooks from public elementary schools in the United States as well. When using these materials, children will acquire a well-balanced language skillset including listening, speaking, reading, and writing abilities. If we teach the children "Ringo means apple," the children will develop a habit of to translating Japanese into English in their heads before speaking. It is not possible to hold a fluent conversation if children learn English this way. With an input of materials that are made for understanding in English only and an output of communication with a teacher, the children will gradually gain the ability to use English as a communication tool. By repeating this, their ability to speak English without much thought will develop. 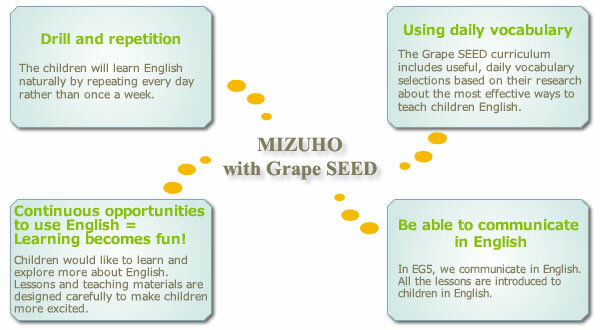 Grape SEED is a completely new solution for children to learn English. The focus of these teaching materials is to allow children to master English as if it were their native language.